If the surface cartilage is torn, this is most significant as a major shock-absorbing function is compromised. Large pieces of articular cartilage can float in the knee (sometimes with bone attached) and this causes locking of the joint and can cause further deterioration due to the loose body floating around the knee causing further wear and tear. Most surface cartilage wear will ultimately lead to osteoarthritis. Mechanical symptoms of pain and swelling due to cartilage peeling off can be helped with arthroscopic surgery. The surgery smoothes the edges of the surface cartilage and removes loose bodies. Unstable cartilage can be removed. It is common for the surgeon to then perform micro fracture. This is where a small, sharp pick is used to perforate the underlying bone and encourage healing of the cartilage defect. This can result in a good outcome, but does not replace the defect with normal cartilage. Occasionally cartilage replacement is required. This can be achieved using various techniques. The most common way of treating smaller defects is by a method known as mosaicplasty (OATS). 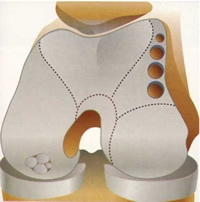 This is where small cylinders of bone and cartilage are harvested from a less important area of the knee and packed into the defect, creating a cobblestone-like repair, with true cartilage. OATS procedure (osteoarticular transfer system) restores the chondral surface by transplanting multiple healthy cores of articular cartilage and bone from a healthy perimeter area of the knee into the damaged area. This is done if the lesion is 1cm- 2 cm in diameter. This is done with one operation using arthroscopy and a small incision. Down time is the shortest for this procedure with a month or 6 weeks on crutches and return to activities in 2-4 months. Pain relief is seen in 1-2 months.